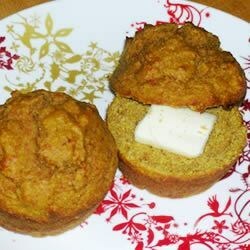 "These moist golden orange muffins pair equally well with jam at breakfast or with soups and savory main dishes." Preheat oven to 425 degrees F (220 degrees C). Grease muffin cups or line with paper muffin liners. In a large bowl, stir flour, cornmeal, baking powder, baking soda, and salt and make a well in the center. In a small bowl, stir together the eggs, pumpkin, sugar, and oil. Make a well in the center of the dry ingredients and pour in the egg mixture. Stir just until blended; do not over mix. Fold in pecans. Divide the batter evenly among prepared muffin tin cups. I took these to a pot luck, the kids were eating them up like crazy! I did add some pumpkin pie spice to zip them up a bit. Awesome! I added a splash on vanilla extract and about a tsp of pumpkin pie spice. These were wonderful warm with butter. I tried to make this in a bundt pan and it simply did not work. The middle of the cake was completely raw. I will try it again as muffins because I think it does sound great.